22-Sep-2005 -- This time we completed loading containers in the Port of Sepetiba (State of Río de Janeiro), and today morning at 09:30 we unberthed from the Container Terminal. The Port of Sepetiba is located about 50 km west of Río de Janeiro, and during the last years it gained considerably on importance. More and more ships do call it on a regular basis, due to the fact that Río de Janeiro is draft-restricted and became too shallow for accommodating the huge container ships of the most recent generation. Sepetiba, however, has the big advantage to be a deep water port. For our ship it was the first call at this port, and on such an occasion it is a nice act of courtesy in Brazil to get an award. Commemorating this event, the Superintendent Director of the TECON Terminal handed me over the so-called "First Vessel Certificate", on a beautiful engraved plate. Sepetiba lies in a romantic, idyllic and scarcely populated bay and is reached from sea via a dredged channel. The passage from the open sea to the TECON Container Terminal takes about one and a half hours. Here the container ship "Cap Castillo" is berthed at the TECON Terminal. Roghly half way between the entrance of the Bay and the Container Terminal there is 23S 44W, and surprisingly almost exactly in the fairway of the dredged channel. As my ship is not a deep draft-vessel, it was no problem to leave the channel for a while and to visit this marvellous offshore point. As the point lies in a bay, we have view of land in all directions, thus to the North where we see the mountain range of its northern coast. To the East we look back from where we just came, and we see among other things the islands of Jaguanum (right) and Itacuruça (left)... and of course our ship's keel water. 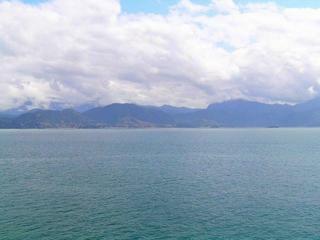 To the South we see Ilha da Marambaia which forms the Eastern border of the Entrance to the Bay. Finally, to the West there is Ilha Guaíba, a bulk cargo terminal for extremely huge ships, and connected to the shore by a causeway. Having a closer look to La Guaíba Terminal we see two large ships berthed there, one of them, on the southern side of the jetty, is the Panama-flagged tanker "Ruhr N". During navigation through the Baía da Ilha Grande and Baía de Sepetiba pilotage is of course compulsory. My pilot was old "roughty-toughty" Captain Durvalino de Souza from Río de Janeiro, who is herewith duly introduced and lets congratulate him for his first successful confluence! (Probably this will be his last one as well, as pilots are not sailing offshore but are only acting in areas for which they are especially trained and experienced. Many pilots, however, have been deep Sea Captains previously, but abandoned sailing due to age or family reasons). Shortly prior reaching the open sea, Captain Durvalino leaves my ship and I am alone again. Here we see him disembarking into the pilot launch after his successful job. Good bye Captain Durvalino, and "bem vindo" again next voyage! #5: Captain Peter receiving a "First Vessel Certificate"
In the waters of the Baía de Sepetiba, about 3 km from an island.